On May 2nd I attended the diaconate ordinations of twenty of my Legionary brothers. They’d all been my students the year before, and some of them I’d worked with as far back as 2003, so I am proud to have helped them reach this important moment in their lives. Please keep them in our prayers along with the twenty-four other Legionary brothers who will be ordained deacons over the next month and a half all over the world. 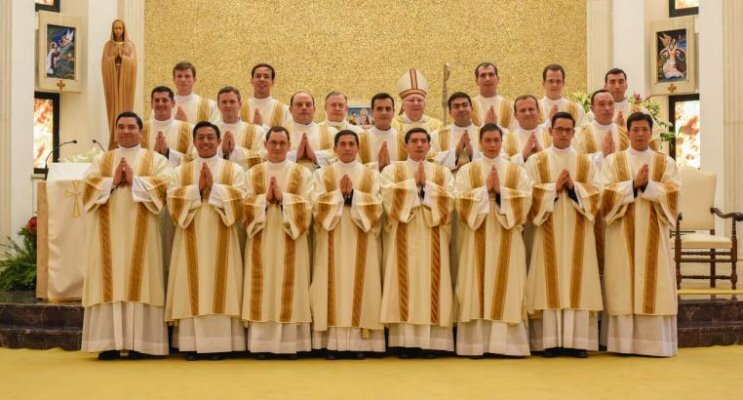 God-willing all 44 of them will be ordained priests in Rome on December 12th. Pope John Paul II in an address to permanent deacons said that their contribution to the Church was that they “sacramentalized” the Church’s service: deacons are a sign of Christ, who became the servant of all, and a reminder that we are all called to serve others. In the case of the Legionary deacons, who’ll exercise this sacred ministry for a few months before becoming priests, it is a perfect introduction into sacred ministry. As priests and bishops we never stop serving in imitation of Christ, and it’s poignant reminder of that whenever we work with deacons and remember our own diaconate ordination. The deacons were ordained by a Legionary bishop, Brian Farrell, who works in the Vatican, so in this photo we have all three degrees of Holy Orders represented (our General Director, Fr. Eduardo Robles-Gil, is in the photo to the bishop’s right. Each one of these men is an answer to a prayer, so let’s keep praying for vocations.